How adorable are these? 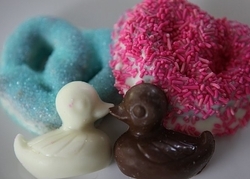 Our little duckie pretzels are the perfect Baby Shower Favor. Sourdough pretzels dipped in luscious white chocolate, finished off in festive sprinkles and adorned with a chocolate duckie. Impress your guests with these scrumptious party favors. Each favor is individually wrapped in cellophane and ribbon.